Kevin Durant has been recently sidelined after an ankle injury took him out during the matchup between the Golden State Warriors and the Phoenix Suns. Now, coach Steve Kerr has released a statement that he’s expecting the 30-year-old to come back in their remaining three-game road trip, CBSSPorts reported. However, Kerr didn’t provide any details when exactly Kevin Durant will be back. The Warriors’ upcoming games include the San Antonio Spurs, Oklahoma City Thunder, and the Minnesota Timberwolves – all three of which will occur between March 17 to March 20. Anyone who’s waiting for Kevin Durant’s return should keep their ears on the ground about those impending matches. The superstar’s injury was sustained when he attempted to pass the ball after the Sun’s defense was collapsing on him. This resulted in him landing awkwardly on his ankle. Following the incident, Kevin Durant was seen walking off the court without assistance during the game’s fourth quarter. The match eventually led to a huge upset as the Suns won 115-112. However, the Warriors did win their recent match against the Houston Rockets after a back and forth battle that resulted in a 106-104 victory. Stephen Curry praised his teammates’ effort in filling the shoes of Kevin Durant, naming Klay Thompson and DeMarcus Cousins as those who step up to lead the team. Indeed, Cousins and Thompson managed to score 27 and 30 respectively and made their presence felt on the defensive side of the hoop. Side-stepping into Kevin Durant’s free agency, the talented forward has yet to share his thoughts about the matter and he’ll likely be reticent about it in the coming months. 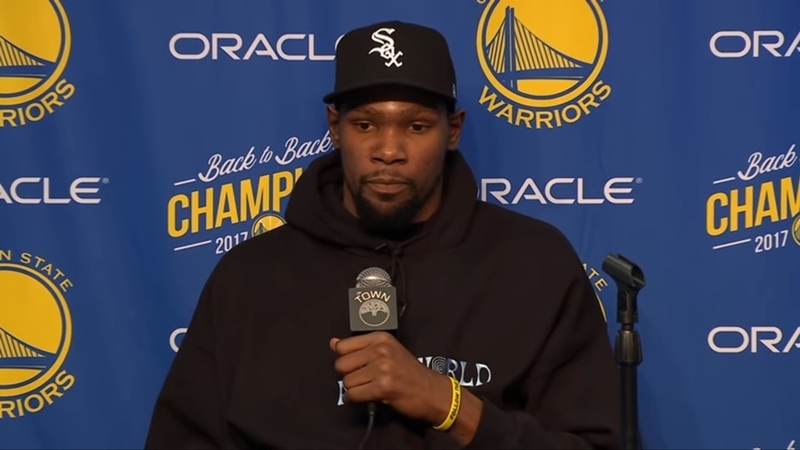 It can be recalled that Kevin Durant snapped at the media last month after journalists incessantly asked him what he’s planning for the future. A few weeks later, another rumor plagued the superstar after video surfaced on the web where Durant can be seen talking with Kyrie Irving. The clip resulted in multiple speculations that the two are planning to team-up in the future with the New York Knicks touted to be their destination.